Terry Thornton in his blog post "Photo Challenge" asked his fellow genea-bloggers and H.O.G.S. Bloggers to post one of the "defining" photographs of your life and to explain why you are all dressed up in a costume as an adult. Being the rather staid fellow that I am, and thankful that there weren't cameras on hand (to my knowledge) when I dressed up as a woman on Hallowe'en one year (well, maybe two), I searched my photo archives for pictures to post. I decided on this one, taken 21 March 1970, which I consider to be the very best day of my life. You can see why - isn't she beautiful? After 37 years, she still is beautiful, and the most caring, friendly and fun person I know. To Terry's question: I am dressed this way because this was a traditional church wedding and reception in the church hall. * I left Linda's two-pence coin at the apartment - and it delayed the wedding about 20 minutes for me to go back for it. * At the reception, when we cut the cake, she smeared cake all over my face. I only got it in her veil. * When Linda's brother was driving us to the airport, he ran over a box spring on the roadway and the car got stuck. The three guys lifted the car up and dragged it out. * When we got to the airport near Los Angeles airport, we had a midnight champagne toast in our room. The rest is history! This certainly was a "defining" moment in my life. From this decision - this time - have flowed home, food, love, happiness, babies, church, vacations, sports, friends, grandchildren, and family history. There ARE things that happen in a second that take a lifetime to explain! Thanks for sharing your photo of the "best day" of your life! Yes, she is a beauty! And before you got to moving the hair around on your head, you weren't so shabby either! LOL! 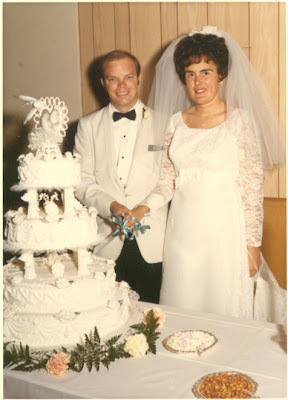 I appreciate your answering the challenge with such a wonderful recollection and photo of you and your lady. THANKS. Nobody went to the Party? I'm not using Vista, are you?